This is my hubby's recipe. He apparently started doing this as early as when he was in high school and my mom in law says she never helped him with the recipe. This is the simplest egg preparation I have come across yet but totally loved by all at home. I hope you have the same success satisfying the palettes of your dear ones with an easy yet scrummy egg roast. I am enjoying the monsoons. Rain splattering outside, my children screaming and screeching at any bug that flies into the house, its chaotic, homely fun. It's wild. I have to add there is nothing like moms cooking. I guess it's rightly said that the taste is because they add a pinch of love. I am wrapping that love and this weather over me like my favorite afghan. I will need it when I leave. 1.Heat oil in a pan and saute the onions, do this on medium high heat and stir often.Turn down the heat when the onions become golden brown. 2.Add the salt and chilli powder and saute for a couple of minutes. 3.Cut the eggs into halves and place them on the pan, cut side down and put all the onion slices on top of the pieces. 4.Turn the egg halves when the side is slightly browned. 5.Do the same for the other side too. Serve warm with roti or rice. wow..so easy and looks yummy Nami..
Looks great, I made them last week with Chana masala too. Do I see a Egg with 2 yolks there? So cute! Egg roast looks delish yaar. so simple and yumm. looks lovely! 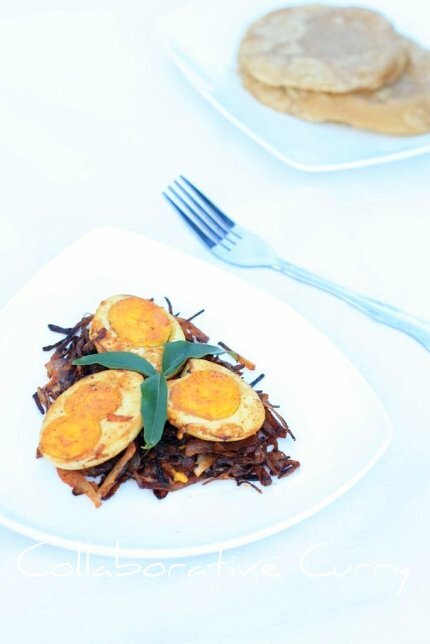 Sounds delicious and so easy to make..
Lovely simple egg dish.Sometimes simplicity brings out the best flavours. Simple and yummy egg roast..nice one. Hey thts quick n luks interesting too. Simple, quick and droolworthy egg roast, drooling here..
Nice egg roast from him. Looks good. I have seen egg with two yolks,may be supposed to twins. Monsoon season sounds like a good time for change and renewal. too much to resist..i love this too.how r u soaking in the iNDIA trip? Perfect side dish for any food. Hats off to your hubby for making such a delcious egg roast from a early age. Simply Delicious !! Ready in a Few minutes too !! That's really simple and delicious egg roast. 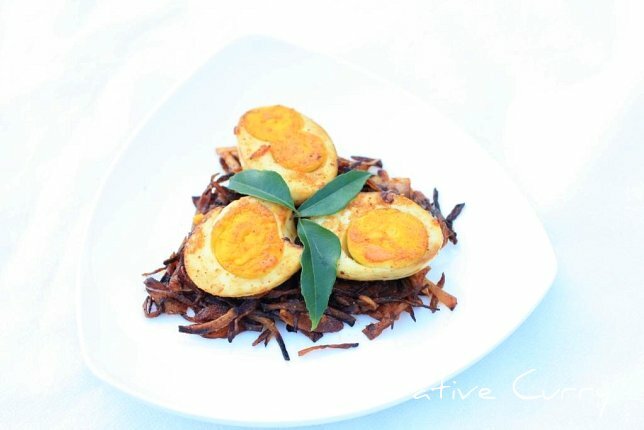 wow nice egg masala n nice presentation. Simple, easy and yummy recipe, looks delicious. wor, your hubby also a good cook, never see a simple egg recipe like this, must try one day. Thanks to your hubby ok, hehehe.. Perfect, simple and yummy dish. Enjoy all the love and warmth. looks delicious namitha..simple and nice..
Easy n nice egg roast dear..
Glad to know that u guys are having fun...enjoy ur trip...looking forward to more delicious recipes from your trip...mm...eggroast looks beautiful n delicious...lovely pics! perfect easy recipe for evening snack or as starter. would make it as love anything with boiled eggs. have fun girls. Kollalo!Less ingredients but better taste.Im going to try this tommorrow morning itself. Nice and easy!! you are in India right now aren't you?.. Looks great. Nice pictures.... Gorgeous looking egg...YUM! This is one dish we make at home almost every week as a side dish. I also add turmeric for some colour.. and yes, it sure is scrummy!! Love the clicks! sure sounds so wonderful and delicious! Sounds very simple and delicious!! This pic is brilliant..it looks like a bird's nest with eggs..
Glad the moonsoon started , we will be grilled under the heat this weekend! TOday is my lucky day... Just hopped from Sarah's place and bookmarked an egg curry recipe from hers. And here i find another egg recipe. I have a terrible weakness for eggs and cant get enough of them. Thanx for this super simple recipe.